Symmetry is the key to solving differential equations. There are many well-known techniques for obtaining exact solutions, but most of them are special cases of a few powerful symmetry methods. Furthermore, these methods can be applied to differential equations of an unfamiliar type; they do not rely on special 'tricks'. Instead, a given differential equation is forced to reveal its symmetries, which are then used to construct exact solutions. This book is a straightforward introduction to the subject, and is aimed at applied mathematicians, physicists, and engineers. The presentation is informal, using many worked examples to illustrate the main symmetry methods. It is written at a level suitable for postgraduates and advanced undergraduates, and is designed to enable the reader to master the main techniques quickly and easily. The book contains methods that have not previously appeared in a text. 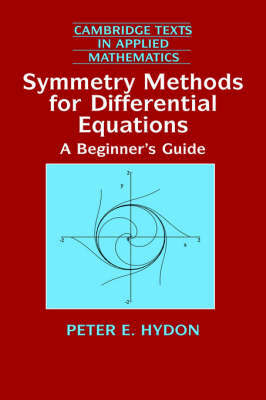 These include methods for obtaining discrete symmetries and integrating factors.